Advertisers can leverage the time people spend inside mass transit with interior “car cards”. Anyone who has been on train, bus or subway knows your eyes look around the train car and wondering eyes fixate on interesting designs, bold colors and the occasional break dancer in the isle. Unlike most Out-Of-Home advertising, interior car cards are not viewed while moving past the message, but read up close and for extended periods of time by commuters. These advertising messages should be clean, rich in information and look amazing. Depending upon the market, interior cards are available as both backlit and non-backlit. Cards that are not backlit are generally produced on 5-ply or 18 pt. cardstock and occasionally on self-adhesive vinyl. Backlit car cards are produced on backlit paper, such as Monadnock Ultraform or Opaline. Because the interior of a bus varies city to city and is different still from a subway car, BPGraphics has an extensive library of templates to help your designers get artwork done right the first time. We also offer a variety of printing options to best match the substrate for your project. With one of the largest 5-color screen presses in the southwest, we can mass produce graphics on rigid substrates quickly and affordably. We also have digital presses for flexible options and smaller quantities or multiple creative designs per run. Two of the most popular sections of the bus or train interior include – side cards, running the length of the bus or train and end cards, displayed at the end of train cars. But why stop at interior cards? In major cities like New York and Chicago, “Brand Trains” are very popular advertising platforms. 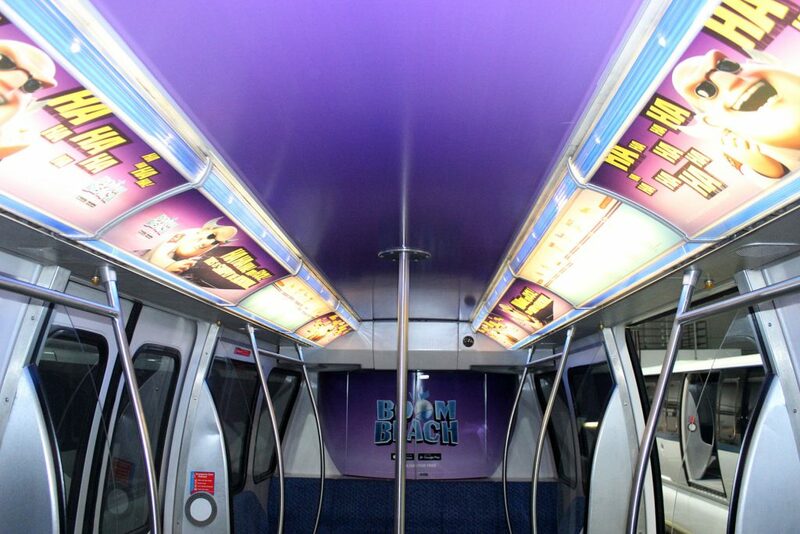 Brand Trains allow you to purchase the entire vehicles advertising space, inside and out. Car Card 11x28 11" x 28"
Car Card 11x46 11" x 46"
Metro North Car Card 33" x 21"
Interior Car Card 10x45 10.875" x 45.875"
Deliver your message to a large captivated audience with impressive graphics.